We have been taking things pretty easy from a purely academic point of view lately. Even though our year runs to a general kind of plan, it is not rigidly fixed. We are actually ahead of schedule on the bits I need to keep on top of. It seemed as good a time as any to devote some much needed attention to fixing our decaying verandah. There is half a dozen medium sized projects which need to be done, all with the verandah as the common theme. The boys love working with tools. Whether they are hammering rocks into rubble, cutting wood or building things, they really enjoy the physicality of it. I like to encourage them in this. It is not always easy. If I am not arbitrating arguments between them or stopping everything to feed people, I am falling over them, negotiating to get my tools back, or having my previous work enthusiastically undone as I focus on a different part of the job. Still, there is no denying they are keen. On of our jobs involves pulling up a large section of old pavers in one part of the yard, and relaying them in another. This has been a lot of fun in its own kind of way. The pavers in question need to be laid out in a flat plane which angles to a certain drainage point. This means lots of working with spirit levels and string lines. There is also lots of measuring to work out how much paving we need, how much we can find, and how we are going to deal with any difference between the numbers. Despite having to think it all through, most of that kind of work ultimately comes down to digging and shovelling dirt. The boys think its great. Outside of helping me, they have also constructed a series of roads under the house. We stop sometimes to deal with broken tools or various cuts and scrapes. They have both given themselves that distinctive graze in the centre of the back which comes from crawling out from under the house and standing up too early. 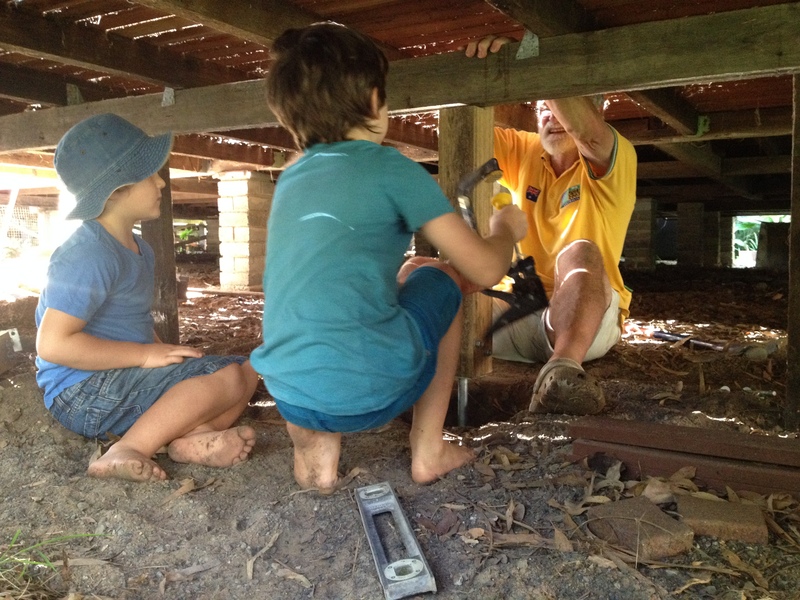 The other project we have been working on is replacing a series of supporting poles under the verandah. This was a great project for the boys. There was a lot of cutting and drilling big bits of timber, then holding it all together with heavy bolts. We got to use the car jack and a collection of makeshift props to hold the verandah up while we cut away the old posts. The highlight of the show was having a legitimate reason to dig holes under the house and fill them with concrete to act as footings. My father in law was helping for that particular project, and the boys were with us every step of the way. While these sorts of jobs involve a fair amount of maths in the planning part, it would be a stretch to suggest that the boys really picked up on that level of detail. They understand the importance of measuring and cutting carefully, but I certainly cant claim that they manage much of that on a practical level. They will dig holes wherever they are standing, and will take hammers and saws to whatever is in reach. They require lots of direction and the whole process can be slow and frustrating at times, but overall we enjoy ourselves immensely. Outside of the physical exercise and gross motor skills, I think that more importantly, this style of work builds a lot of self confidence in the boys. There is a lot of safety and responsibility involved in working with tools like this. There is a great deal of satisfaction for them in building on a grand scale. They get a sense of being one of the adults as they struggle to haul around a bag of concrete or not to overturn the wheelbarrow. Last of all, they dont just get to help, they get to help repair the house we live in. There is no doubt in their minds that they could pretty much build their own house if they wanted to. It gives them a surety in themselves far beyond the size of the finished job. 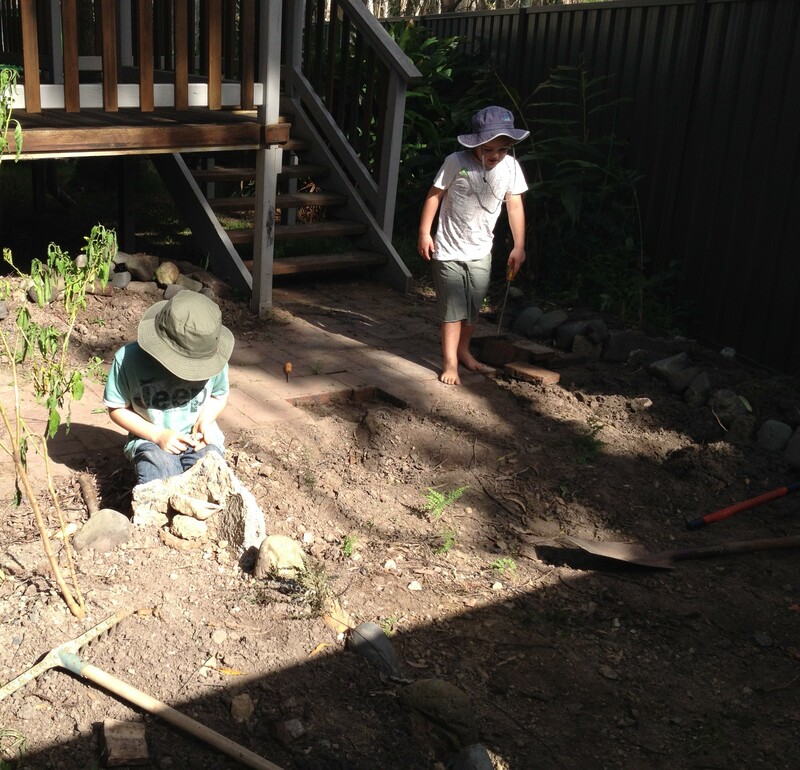 This entry was posted in Teaching and learning and tagged bloke, confidence, flexibility, homeschool, learning in context, life experience, negotiation, play, safety, self determination. Bookmark the permalink. Nothing like real life and learning! A college degree is great, but when it comes to home repair, firsthand knowledge goes a long, long way towards self-sufficiency.